It was almost unbelievable. Here I sat, after stalking a quarter of a mile over the course of an hour, crouched behind a mirror blind less than 40-yards away from a big male pronghorn who was completely at ease and unaware of my presence. 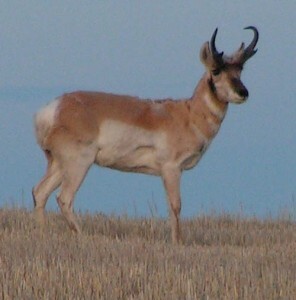 Pronghorn antelope are incredibly wary and have vision that is four times more acute than that of a human. Despite their ever-watchful eyes and blazing speed I had succeeded in coming within bow range, and all that remained was to carefully draw, aim, and fire. It was September and archery season for pronghorn antelope in Colorado. My hosts for this trip had informed me that the trick to getting close to the pronghorn in this area is to pretend that you’re just another farmer or rancher out getting some work done. The open plains of the southeastern part of the state where we were hunting supported large amounts of agricultural activity, and the antelope are accustomed to the routines of local farmers and ranchers. While out scouting a few days prior we had rolled to a sudden stop after spotting a large herd not far off in the distance. It took only one member of the herd to decide that something was amiss. When that single pronghorn broke into a run it was enough for the rest of the herd to follow suit. Within seconds they were all moving across the plains as a single unit. Like water they poured down a shallow rise into a draw where they had some cover. Following that shallow wash they crossed the road ahead of us and continued on until finally they stopped over 1,000-yards away. 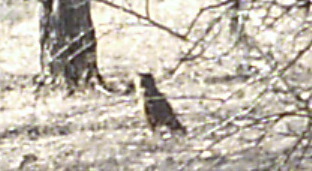 At that range they were barely able to be seen, even with my pair of 12x25mm Bushnell Powerview FRP compact binoculars. On the way back after our scouting trip we stopped to visit with one of the landowners whose property we were going to hunt to see if he had any tips for us. Lloyd Brown was a cheery fellow who nearly doubled over in laughter when told that I was chasing after antelope with only a compound bow. In his opinion, my chances of being able to stalk up to within 60-yards of even a single pronghorn were somewhere between slim and none. Lloyd did have one thing that might help us however. After a bit of searching he emerged with what he informed me was a mirror blind. I’d never seen anything quite like the device that was presented to me. Part of me wondered if they weren’t having a bit of fun at my expense. After a bit of discussion I was assured repeatedly that this was indeed a very effective method for stalking extremely close to pronghorn antelope. The blind consisted of a single silvered piece of plastic attached to an aluminum frame. A small cut-out in the upper part of the blind allowed me to peer out while remaining completely concealed. The tiny porthole was obviously designed to enable a hunter to stick the barrel of a rifle through and take a shot while safely out of sight behind the mirrored panel, but it was too small for me to make the same shot with my bow. Two handles folded out to the rear from either side of the frame, and there were hooks set on either side for bow or rifle to be hung so that both hands could be used to support the blind while stalking. A small foot rest folded out from the bottom to allow for hands free use. By stepping on the foot rest, the blind could be leaned forward without any additional support and not tip over. The next day I awoke to find the skies gray with a cold and steady drizzle falling. Our first stop was the pasture where we had spotted the large herd a few days ago while out scouting. 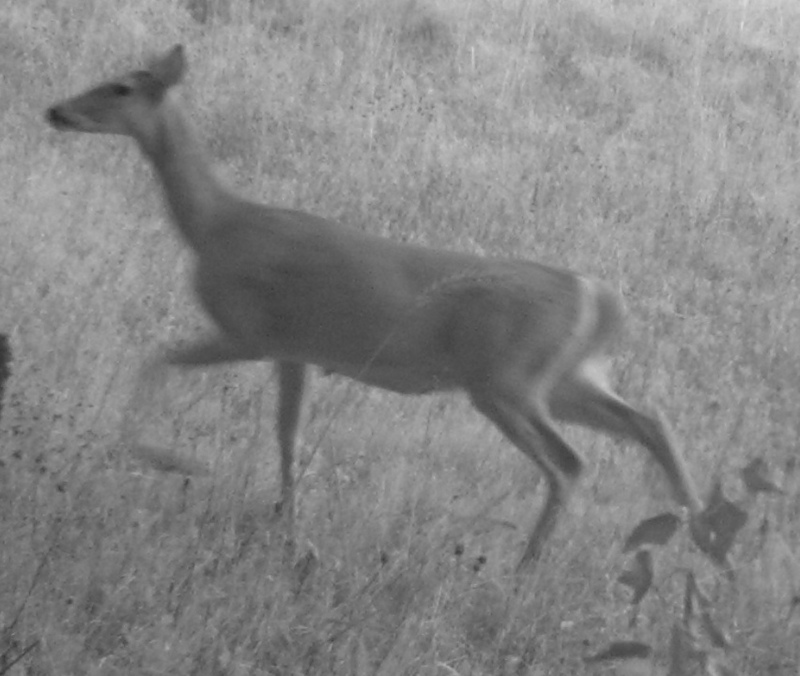 The herd was gone, but a single buck wandered across a terraced field nearby. He didn’t spot us at first. 800-yards away, he casually browsed among the sage and wheat stubble. I unloaded the mirror blind and readied my bow, trigger, and range finder. Instead of making a direct approach with the blind, I set out down into an arroyo where I would be hidden from his field of view. When I was within about 300 yards of where I last saw him, I slowly crept, mirror blind in place, up to the crest of a hill and peered through the tiny window cut into the top of the blind with my Bushnell 4x20mm ARC rangefinder. Desperately I scanned the horizon and strained to see any sign of antlers moving amongst the scrub at the bottom of another draw, but the buck was nowhere to be found. I continued to stalk for another mile and a half in the direction I had last seen the buck moving, stopping every few hundred yards to glass, only to come up fruitless. The cold drizzle picked up to a slow steady rain with gusty winds and left me thoroughly frustrated and miserable. By the time I gave up and hiked back to the truck I was soaked through and through. So far, the trip had been a bust. Discouraged but not undaunted, we drove off to another area in search of pronghorn. The mists and rains continued to move through the area as we searched without any luck. All of the antelope, smart creatures that they were, had bedded down out of the foul weather. After a few more hours glassing the vast Colorado plains we decided to call it a bust and try again the next morning. The next day, we hoped, would be better. There was not a cloud in the sky as dawn broke that morning. After a hearty breakfast we set out once again to glass the fields and find our prey. The previous evening we had decided to try to isolate a small herd or, ideally, a pair of antelope. The fewer eyeballs there were the better chance I had of sneaking up on them by slowly moving when they were turned the other way. We drove for an hour or so before we spotted two pronghorn, a buck and a doe, bedded down about 400 yards away. Instead of stopping and taking the chance that they would spook, we kept on driving about a half mile past them. There, hidden from view by a slight dip in the terrain, I geared up. Rangefinder, binoculars, bow, quiver, trigger, and last but not least the mirror blind all came out of the truck. I carefully plotted the path I would take. A row of bushes provided cover for me as I slowly moved into the field. By making my way along this path I could get within about 250 yards before I would be forced to deploy the blind. The wind was blowing hard from the north at about 15 miles per hour, with sporadic gusts topping out over 20. By making my approach from the south, into the wind, not only did I eliminate any chance that they would catch my scent but I also hoped to make the shot easier by reducing any compensation for the stiff breeze. With the blind deployed, I kept my eyes trained on the wary antelope and moved only when both were looking away. For the better part of an hour I moved one step at a time, inching my way closer. As I drew closer I pulled out my Bushnell Chuck Adams Edition rangefinder to check my progress. 90-yards: still too far for a good shot, and yet my heart was already pounding. I simply could not believe that the mirror blind worked so well that I’d been able to get this close to such notoriously high-strung game animals. Still, 90-yards was too far for an ethical shot in my opinion, so I edged ever closer. At 50-yards I stopped again. Now I was within range, but still I considered the gusting winds and the pronghorn who remained bedded down. The buck I had been eyeballing calmly chewed the cud while he glanced around, completely oblivious to my presence. If they were this calm now, it might be possible for me to stalk even closer and ensure an easy shot. Slowly I picked up the mirror blind and moved to within 40-yards. The antelope did not pay me the slightest bit of attention. And so it was that I found myself so incredibly close to my quarry. My rangefinder indicated a distance of 37-yards and virtually zero slope. 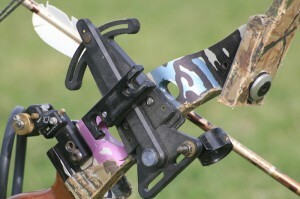 Hands shaking from adrenaline, I removed my bow from its hook on the back of the frame of the blind and nocked one of the 29″ 300-grain arrows from my bow-mounted quiver. Now came the tricky part: I was facing directly into the wind, and the 15 square feet of mirrored plastic of the blind acted like a giant sail with each gust. This wasn’t a big problem while stalking since I had both hands free to keep it stabilized. Now, with both hands occupied with the bow, I didn’t have any way to keep the blind in place. The foot rest attached to the bottom of the mirror blind was designed to keep it from falling forwards, not backwards. I was left holding the bow and trying to use my left knee and shoulder to keep the blind from toppling over. Failure is always an option. Unbeknownst to me, I had Murphy as a hunting partner. With the bow at full draw I leaned out around the right side of the blind. The TruGlo sight was perfectly centered in my rear peep and the 40-yard pin rested slightly behind the front shoulder of the pronghorn buck. I took a deep breath in, steadied my aim, and felt the blind pivot off my left shoulder as a sudden gust of wind took it. With a crash it fell to the ground and left me completely exposed as both antelope, suddenly realizing that there was a predator in their midst, leaped up. In a vain attempt to salvage the situation I tried to follow the buck as he rose and released my wrist-mounted trigger just before he turned to bound away, but the shot went high over his back in a clean miss. My heart sank while the buck and doe turned off the afterburners and sped off. They didn’t stop until they were well over a thousand yards closer to the horizon at which point they paused and gazed back in my direction, possibly wondering how some human had miraculously appeared out of nowhere. Then they turned again and trotted on at a more leisurely pace, soon disappearing from view. I picked up the blind and trudged back to the road where my host sat holding a pair of high-powered binoculars and chuckling to himself. There were a million excuses of course, and every hunter knows them by rote. Though it seemed everything had gone wrong at the last moment, to me it was still a successful hunt. Despite the missed shot, and the fact that I would be going home without a trophy or meat for the freezer, I had still managed to sneak up right next to one of the most wily game animals in North America. First off, going for a headshot on a deer with a bow is idiotic. Your chances, even if you hit the brain, of a clean kill are somewhere between slim and none. Second, this is also why I don’t do headshots on deer with a rifle either. It’s too easy to miss, and if you don’t miss cleanly you have a zombie deer with grievous but not immediately life-threatening injuries. So when I see articles like this (warning: graphic), I just have to shake my head. A hunter’s arrow that had pierced both sides of a young deer’s head has been successfully removed, according to state officials and the woman who first notified authorities about the animal. Staff from New Jersey Division of Fish and Wildlife tranquilized the deer Saturday afternoon in the backyard of Susan Darrah’s Rockaway Township home, removed the arrow, treated the wound and released it back in the wild, Darrah said today. DEP Spokesman Larry Hajna confirmed the arrow removal. Shots to the vital area of a deer just behind the front legs, whether from a bow or rifle, are always fatal. Don’t risk injuring a deer by trying for a head shot. It just isn’t worth it. 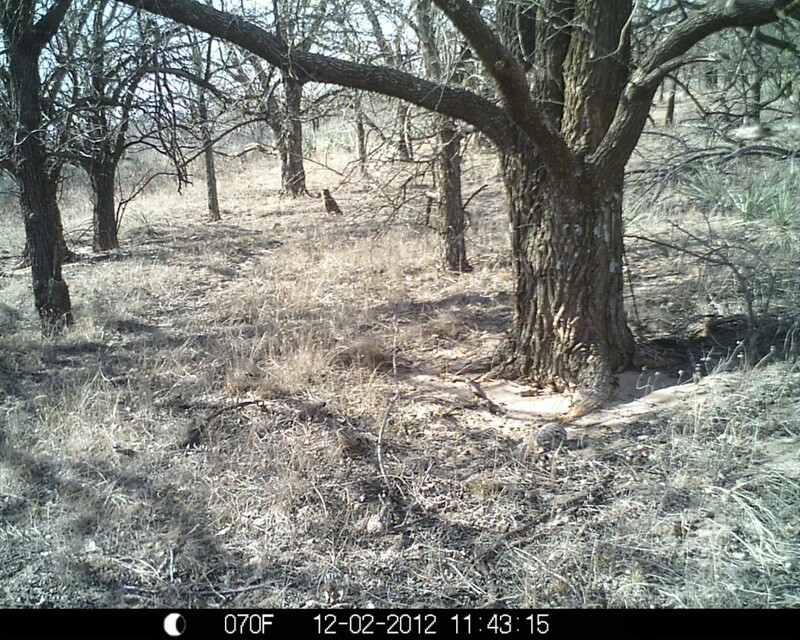 Not much deer on the game camera lately, and I think I’ve figured out why. Bobcats won’t usually take down a healthy adult Whitetailed Deer, but the deer don’t particularly like to hang around where there’s a predator like that lurking. Time to try a few alternate spots. Hunting season is in full swing here and, since I’ve been filling up every precious moment that I’m not working by heading afield and chasing after deer, antelope, and dove myself, I haven’t had much time to write. My friend Evyl Robot however has a fantastic write up on his kid’s first trip hunting. They didn’t get anything, but that doesn’t mean the trip was a failure. Quite the opposite in fact. Both he and his son are new to hunting, this being their first deer season, but they’re learning quick and have had some great experiences so far. Go give them a read and remember what those first trips you took in pursuit of wild game were like. I guarantee it will bring a smile to your face. It sure did to mine! So, I haven’t fired a bow in about 15 years. I’ve long since sold off all of my archery hunting gear, but this year I’ve made the decision to get back into it for deer and pronghorn archery seasons. What gear and brands should I look for and what should I avoid? Any other advice for someone getting back into it?